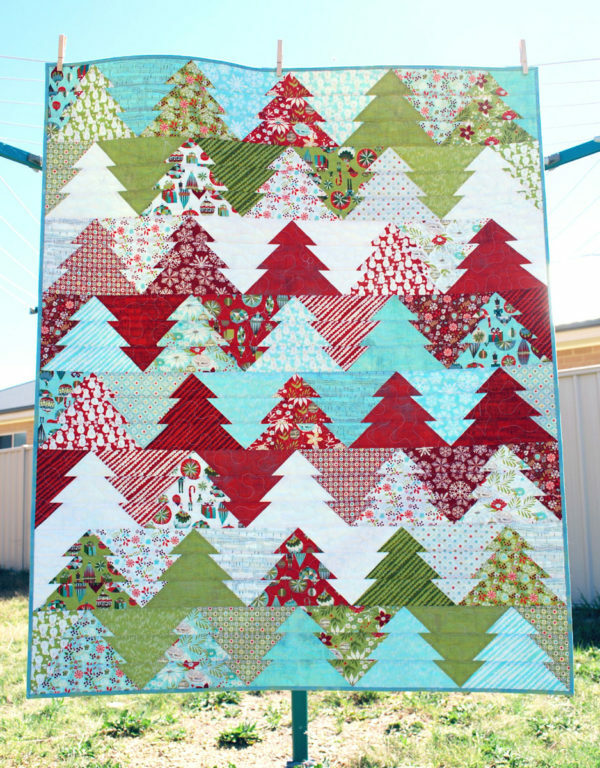 Hope is the guest designer for this month in the Quilt-Group. I’m totally excited to introduce her. 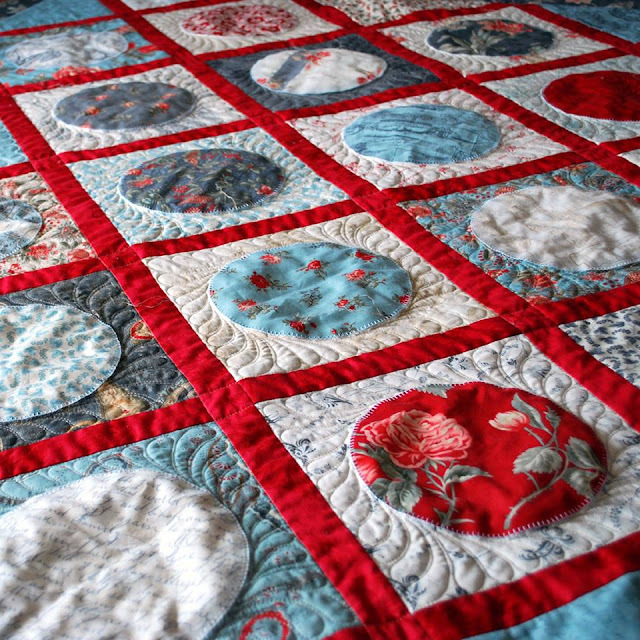 She is one talented gal who is an artist along with her quilting. The pattern she is sharing -Cough Drops- is only available to members. Join here if you’d like to have access to it + more projects than you have time. Join now! I adore Hope’s patterns and designs. 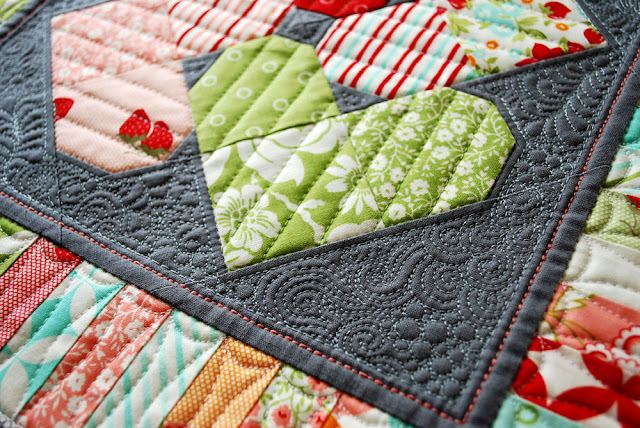 There is such a sweetness to them…and her new block of the month featuring miniature quilt blocks….love! 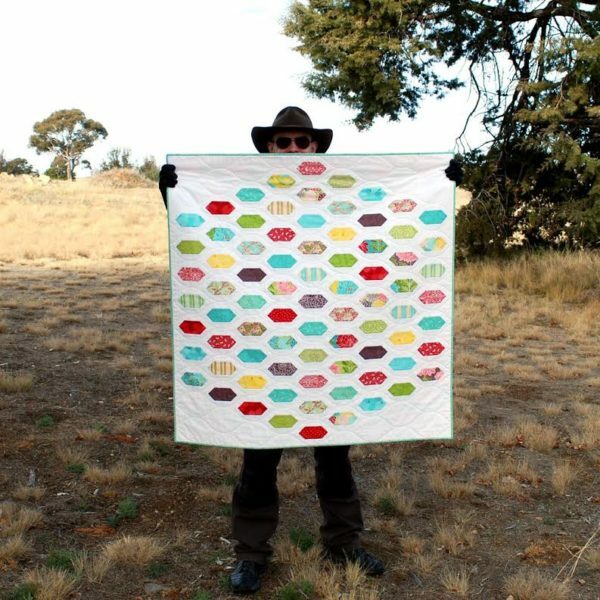 While Hope is one of the designers that I haven’t known personally before..she’s all the way in Australia and neither make it to the other ones country– like ever, it was such a delight to chat quilting with her! The whole idea of being able to share a talent or interest with others so far away from our own location is awesome. I do wish that at some point we will meet up. Until then, chatting on the phone will just have to do. Though my Mum was always a keen sewer when I was growing up, I don’t think I started sewing until I took Textiles at school. Aside from a pillow case and patchwork cushion cover, I mainly sewed clothing for myself. I still wear the clothes I made back then. You know, that’s a hard question! It’s so tempting to say ‘everything’. I’m inspired to sew when I see other people making things, and if I’m wanting to sew but feeling lazy or not in the mood I’ll go on YouTube and watch a couple of sewing videos. Most of the time I am inspired to sew because I really want to see what an idea turns out like, or I want to sew away some stress or worries. Design inspiration is harder to pinpoint, it really does seem to come from everywhere and nowhere. Sometimes I will just get an idea and need to go and sketch it or write it down, and I have no idea where it came from. Other times I will be looking at a traditional quilt block and see something new in it, or a colour combination will inspire me to go and fiddle with shapes and designs so I can then use those colours. Traditional art and folk art from around the world are full of designs that translate well into quilts, as evidenced by many of the quilt designs already out there, but I’m also inspired by animals, fruit, frost, leaves, rain… lots of things! Hmm… I’m not a big gatherer of notions, so my favourite is pretty simple – long, sharp, fine, glass-headed pins. There’s little distortion of the fabric when you use them, and they’re a great aid to accuracy. Aside from those, I love my rotary cutter, large cutting mat and my two most often used rulers, the 6.5” x 24” and 4.5” x 8.5”. A non-sewing item that is also handy is a pack of little fold-back clips from the stationery store. I love them for holding my binding in place when I’m sewing it down to the back of the quilt. What springs to mind is my habit of singing along out loud to the music inside my head without realising I’m doing it. I usually don’t notice until my hubby looks at me with a rather amused expression! I don’t think I do it anywhere other than my own home, but given that I don’t often notice I’m doing it, who knows? 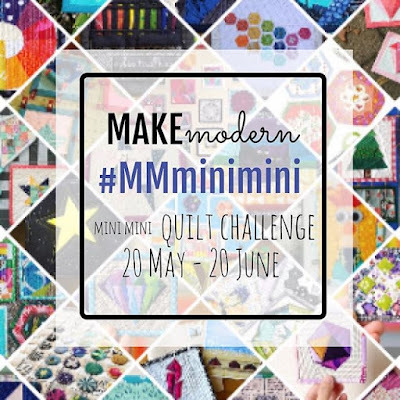 I have about a million and one designs I’m working on turning into quilts and patterns, including an elephant quilt I’m working on at the moment, as well as some very ‘mini’ versions of a couple of existing patterns. 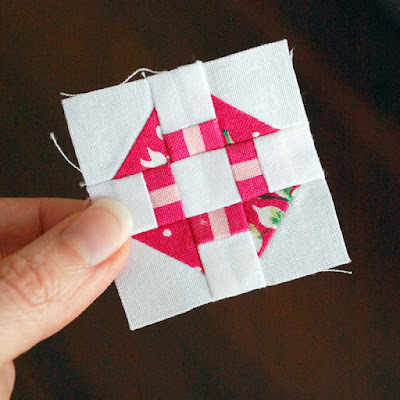 I’ll also continue to come out with more free mini block patterns as time allows. 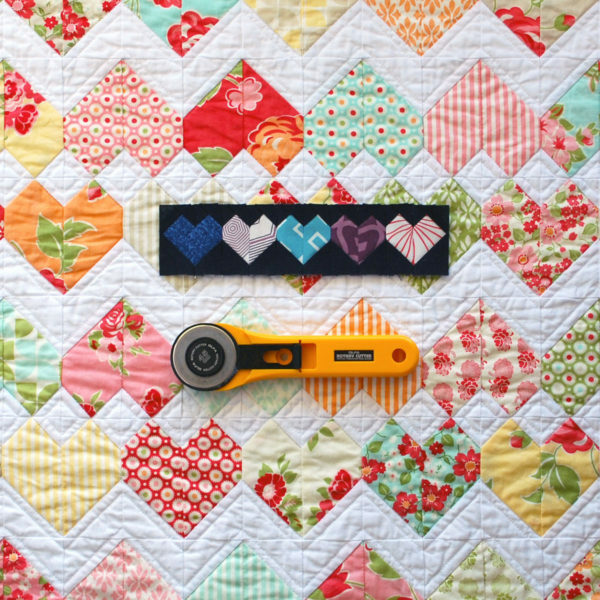 I’m also working on a couple of features for my blog to try to make it more of a resource for beginner quilters, and on posting about topics that I feel need to be thought about and discussed a bit more in the quilting world. Though I’ve been thoughtful of the environment for a long time, I know there is a lot more I can do with regard to my sewing, so I will be going forward with that in mind. I also want to help others become more aware of how this wonderful pastime of ours can have a wider effect on the environment and our fellow human beings. 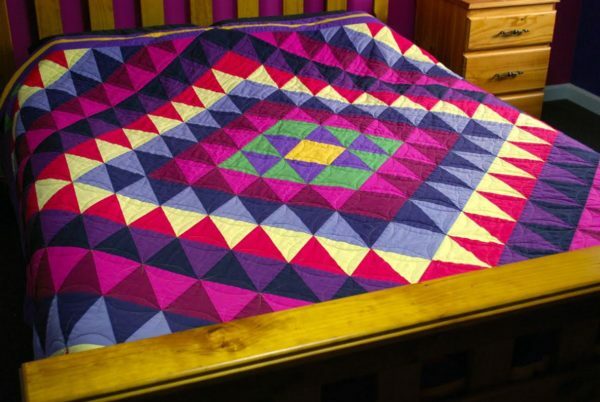 “At the beginning of the year I asked the Quilt Group what sort of pattern they’d like, and a few answered ‘masculine’. I think I ended up with something that is pretty gender neutral, easily adapted to the recipient by choosing fabrics you know they’d like. 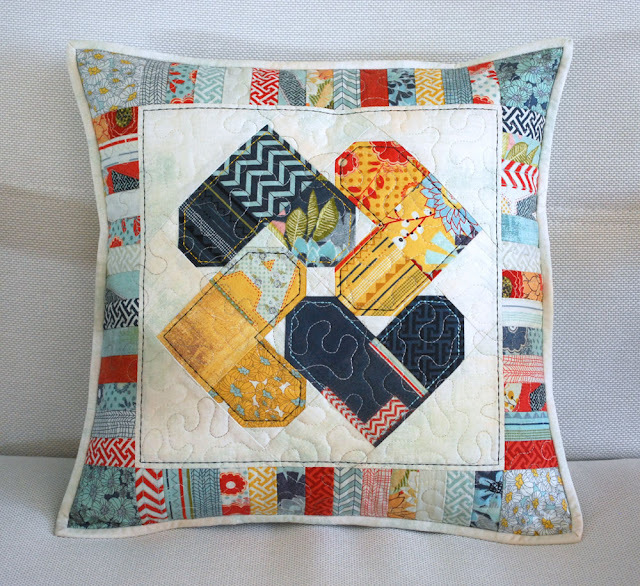 The pattern is called Cough Drop, named by my hubby for the individual lozenge shaped hexagon blocks that make up the design. 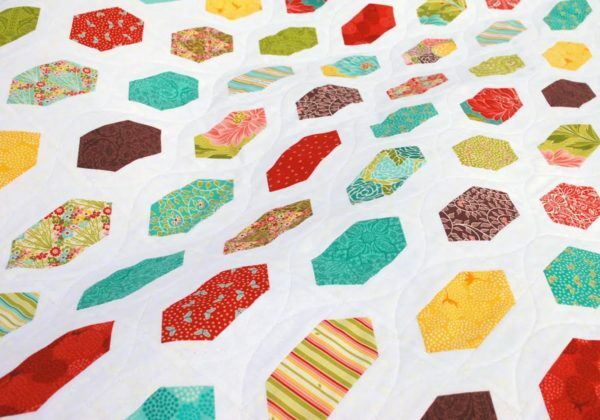 When designing the quilt I started out wanting to make a large hexagon from smaller hexagons and also wanted to be able to use a pre-cut charm pack of 5” squares and something not too difficult. That combination is what led to the final design. For the hexagons/lozenges you’ll need various scraps of fabric, 5” x 2.5”, 79 pieces in total OR one 5” charm pack containing at least 40 squares, 5” x 5” OR 70 cm (27”) yardage for hexagons all of the same fabric. For the background and border you’ll need 1.65 metres (65”) yardage. Make sure it contrasts well with all your hexagon fabrics. For the backing you’ll need 130 cm (51”) yardage PLUS 33 cm (13”) of contrasting fabric. You will also need 30 cm (12”) fabric for binding, and a piece of wadding/batting 116 cm x 122 cm (47” x 49”). Additional requirements: washable fabric marker/pencil, ruler, rotary cutter, scissors, thread, etc.